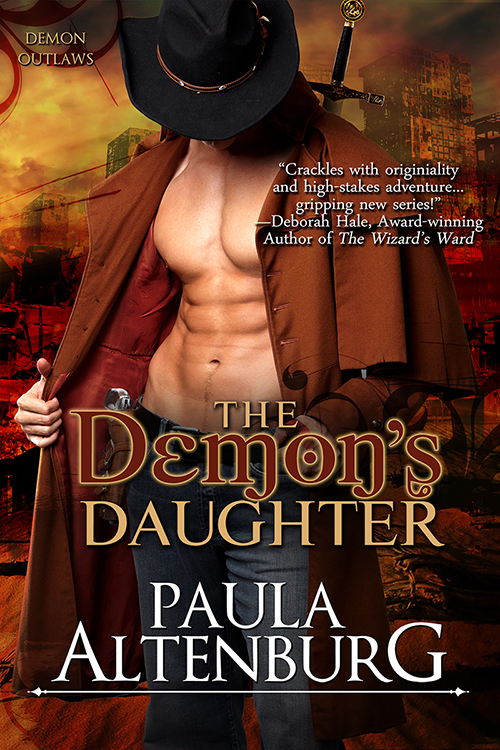 Home / Books By Genre / Fantasy - Dystopian / REVIEW by Ginny: The Demon’s Daughter (Demon Outlaws #1) by Paula Altenburg (@PaulaAltenburg) – Released today! I’m afraid I have a confession to make. I judged this book based on its cover. I know, I know… but look at it. The guy is there all photo shopped and posing in that weird way with a sword on his back and no shirt for some reason and I burst into fits of giggles. Who fights demons without a shirt? As a result, I expected something… well… fluffier. Not a story that had such a heart-wrenching underlying back story for two characters who weren’t even the main love interest. Nor the character insights to the villain and the next installment’s main character. Oh, and let’s not forget that both Hunter and Airie were well developed characters who evolve in a natural (or supernatural) way. My only real complaints are that some of the names were… Uh… You know what, never mind, I can tolerate a priestess names Desire and all the other verbs and nouns as names. Leaving my only complaint being the lack of Scratch. Which sounds really funny now that I typed it out… but I want more of the little boy with no other name, questionable powers, and even more questionable parentage. Maybe in the next book? Please? 4 stars. The Demon’s Daughter is a great paranormal spin on a post-apocalyptic dystopian world that I am eager to explore more in future installments. Previous post: REVIEW by Ginny: Once Tempted (Silver Creek #1) by Laura Moore – Released today! This one does sound promising and your review really pushes it over the edge.